The Cotton Boll Tin - 4 flavors of our gourmet pecans: chocolate, honey, roasted & salted and praline pecans! Cotton is King on this classic tin design. 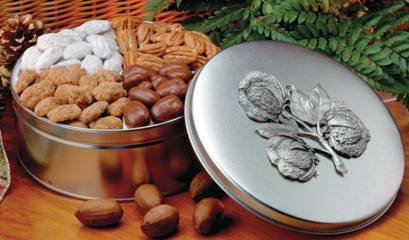 Beautifully hand-cast tin opens to reveal a 4-way combo of our delicious gourmet pecans including roasted & salted, praline, honey and chocolate covered. With the outside as tempting as the inside, the Cotton Boll Tin makes a memorable gift.